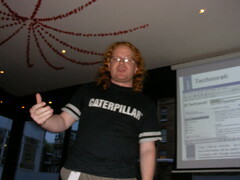 You are currently browsing the Christian Heilmann blog archives for April, 2007. Just before leaving the office today I uploaded a chapter excerpt of the new book Web Development Solutions: Ajax, APIs, Libraries, and Hosted Services Made Easy to the YUI blog. 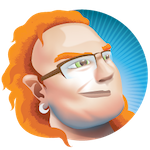 I am going to participate in the Barcamp 11 in Paris on 12th and 13th of May, talking most likely about online identity and generally meeting people again that I met at the Braillenet conference earlier this year. This is going to be fun, I like going to Paris, especially as you don’t need to muck around airports for hours but just hop onto the Eurostar. Today I went to the Powerpoint Karaoke Night in Farringdon’s “The Bear” pub. Whilst very successful in the US, the crowd attracted by this instance of the PPTKN was much like going to a lunch break at the office. All in all it was 6 people who all took on the challenge, 3 of which work with me. Powerpoint Karaoke basically means that you give a presentation you don’t know. All the PPT files are randomly downloaded from the web and you have no clue what lurks behind the next space bar hit – may it be a new slide full of acronyms and schemas that don’t make sense or yet another terrible animation. The crop of PPTs picked randomnly was very weird indeed and ranged from a presentation on cobras most likely assembled by 12 year olds to quantum physics. As with anything with the right people though, the evening was a very good experience and a lot of fun, so for the love of Ian, the organizer, get your arse in gear and come around the next time. The location in Farringdon was a bit to my annoyance (I am not a city fan), but at least the bar tab we accumulated which came up to about 20 pound did not mean the bouncers kept us in to make up for the room use – the city is dead after 7 anyways. The often-seen in my referer log Smashingmagazine spent some time asking 35 Designers 5 questions each about what their favourite CSS trick is, what font they like to use and so on. The outcome of the survey called 35×5 is an interesting read and it seems that despite the raging “which font” debate, we’re all on the same lines. I really enjoyed seeing that so many people agree with me in saying that “don’t make me think” is a very important book. Be there or be annoyed by lots of tweets and blog posts about it. Read about the details over at the official hack day page http://hackday.org/ and I am very much looking forward to seeing you there.